So, I have been taking a drawing class through the local community college and this week’s course material talked about silhouettes. It made me think that we use silhouette images all the time in stamping. In fact, it was the perfect topic for card 3 in the Happy & Simple series. I think the key to making a silhouette image work is having an interesting background to pair it with. Distress Oxide inks are a great medium with this goal in mind as they create lovely textured backgrounds with depth and color. In the card below, I used three different Distress Oxide inks to create a watercolor style inked background in rich shades of orange and pink. 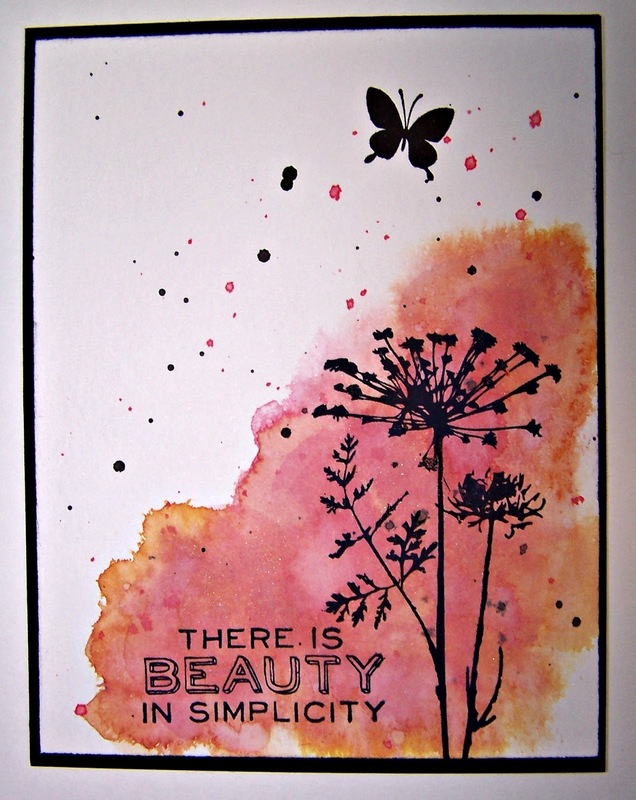 I then stamped a floral silhouette image over the top and added a sentiment (perfect words for the Happy and Simple cards series…I must say). I then added a bit more interest by flicking black and pink dots over the panel. Lastly, I stamped a cute little silhouette of a butterfly to bring your attention up the top portion of the card. The panel was mounted onto black cardstock and adhered to a top folding white card base (5 1/2 x 4 1/4). Hope you are enjoying this Happy & Simple card series. For me, it has been fun to get back to the beautiful basics of card making.